Designed to create the ultimate movie-going experience, Envision Cinemas Bar and Grille in Blue Ash, OH aims to entertain visitors the moment they walk into the door. Beyond the great food, drinks, and movies, high-end technology became a priority for every inch of the venue. Sony 4K screens flank Envision Cinemas Bar and Grille. Electronics systems contractor M. Alan Associates was hired to bring the elite cinema’s vision to life. The theater’s owners were already familiar with the design and integration capabilities of the contractor from a previous residential installation; they wanted to bring that same concept to the theater on a much larger scale, stepping up the visual factor with displays and video sources. 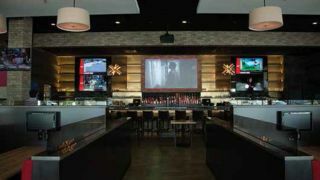 Outside of the large-screen theater are a restaurant and VIP room that needed to offer the most state-of-the-art video and audio systems available. It’s not uncommon for large-scale commercial projects to change over the course of the install. In this case, as the vision took shape, the owners didn’t think the number of displays they originally had planned would measure up to their dream of a truly stunning visual entrance, so they added even more midway through the installation. Between the restaurant, bar, and lobby, 47 displays—most of which were Sony 4K screens—and a Sony laser projector were set up, as well as 16 LG 19-inch displays at each of the restaurant booths. Five additional displays were installed in the venue’s VIP room. With an impressive array of screens, the facility needed the ability to distribute and switch 12 video sources that included six DirecTV inputs, six inputs from the theater’s movie trailer entertainment system, and signage for the theater’s ShowTime system, to any of the displays or the projector system within the facility. Because of the evolving scope of these types of projects, M. Alan Associates knew Just Add Power (J+P) Ultra HD Over IP products would be a good fit. The product’s ability to allow users to create any size 4K or 1080p HDMI matrix using a 1Gb network and Cat-5e/6 cabling worked well for this installation. The products are backed by a three-year-warranty, and can be controlled from a variety of systems, which appealed to the cinema’s owners. To accompany the Sony projector, M. Alan M. Alan Associates selected J+P’s multi-image video tiling processor. The processor allows any screen with a J+P receiver to be tiled, and tiles up to four source devices on a single screen. With a variety of viewing modes, including quad-view and picture-in-picture, it has the ability to turn any of the venue’s displays into an eye-catching video wall or presentation system. Staff at both the cinema and M. Alan Associates are pleased with the project, particularly Just Add Power’s HD Over IP system, which, according to them, has proven to be a robust, highly scalable solution that fit the advanced video distribution requirements of the theater. The product has also helped to future-proof the system, as M. Alan Associates can easily add onto the system as changes happen, rather than having to purchase an exact-sized switcher which may not be adequate down the road. In addition, the system neatly interfaced with the cinema’s chosen RTI RTiPanel iPad control app, allowing employees to switch between any of the 12 sources and distribute the video to any display within the network. It also manages the video tiling processor capabilities, providing them with screen options for the projector setup that can be changed throughout the day. They can select up to four different sources to display simultaneously and other dynamic options.